Having used over a dozen laser distance measures from almost as many brands, it’s clear some key features make a difference. The very first laser distance measure I owned was a Bosch, and I still use it. Since I got that GLM 15, laser distance measures have become more commonplace and bring new technologies and features. Not everyone needs all those bells and whistles, though. I’ll help you figure out which laser distance measure is right for you. We’ve got a breakdown of the important features to look for, so you can decide. Are you working indoors or out? Do you focus on mostly residential or commercial projects? If you’re working on residential jobs, 50 feet of range often covers all your needs for indoor measurements. If you estimate fencing or other outdoor products, you may want to go longer. Commercial applications usually require larger distance measurements, so a longer range tool makes sense. Make the Call: Consider the longest measurements you need a laser distance measure for. Get a model that will extend a little beyond that. Most laser distance meters will have either 1/8-inch or 1/16-inch accuracy at 30 feet. For basic estimating, the 1/8-inch accuracy works just fine. Even if you don’t need to bump up to 1/16-inch accuracy, longer range models typically provide it. Make the Call: Most applications for a laser distance measure will be fine with 1/8-inch accuracy. But more accurate is still more accurate. A basic laser distance measure doesn’t have any memory storage. The best it will give you is the ability to hold a measurement. Others might give you storage for up to 200 measurements or more. Decide how comfortable you are recording measurements in a notebook or on your phone. If you’re a good note-taker or you just don’t trust technology, memory might not be a big deal. On the other hand, if you tend to leave your notebook behind, having those figures in storage might save your bacon. Make the Call: This is a judgment call. I like a laser measure with at least 50 data points of storage so I can have an entire house worth of measurements. I still record them in a notebook, though. The two major screen types you’ll find are LCD and LED. LED is much brighter and easier to read, including in bright sunlight. Many LCD displays have a backlight that helps in low light conditions, but can be tough to read in the sun. “Inverted” colors also help as white text on black is easier to read in the sun than black text on white. Make the Call: Both screen work just fine, but we prefer LED if we have a choice. Real-time measurements give you instant feedback as you move the laser rather than waiting for you to press a “measure” button. It gives you the ability to find an exact distance away from a wall or ceiling so you can make a mark before punching a hole through it. None of our Pro team is interested in a laser distance meter that doesn’t have this feature. 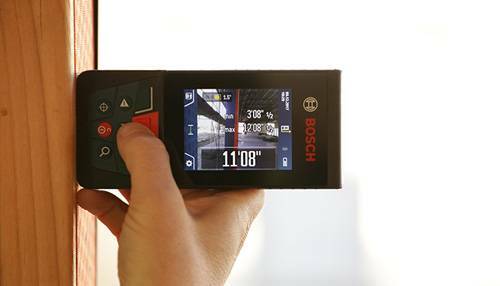 Make the Call: Real-time measurement is a must-have feature on every laser measure. Addition and subtraction are handy features to have when you need to combine two lengths that you can’t measure in one shot or need to exclude part of a measurement. It works in conjunction with distance, area, and volume as well. If you’re doing an estimate for painting, it’s an easy way to take out the area of doors and windows as you go. Make the Call: This is a function you’ll find on all but the most basic laser distance measures, and it’s pretty helpful on area calculations in particular. Chances are that if your laser measure has addition and subtraction, it will also have area, volume, and indirect measurement (see below). This simply allows you to take two (for area) or three (for volume) measurements and automatically get the result. When estimating for paint, drywall, flooring, airflow, and more, we consider this an essential function. Make the Call: Aside from making a basic measurement, area and volume functions are among the most helpful. You’ll want it on your laser distance meter. Indirect measurement goes hand in hand with area and volume functions. 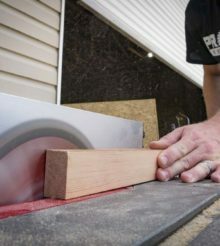 The difference is that you measure straight to the base of the material (the leg of the right triangle) and from the same point to the top of the material (the hypotenuse) to get a height that you can’t measure directly. Make the Call: This one’s not a make-or-break feature for most of our team, but you’ll probably get it along with area and volume. If you’re on the tech-savvy side of things, a Bluetooth connection can help you transfer data from your laser distance measure to your phone, tablet, or computer. There’s likely an app to go along with it as well. Some apps even give you the ability to overlay measurements on pictures or drawings of the work. When putting together a bid or quote, this lets you show your client visuals and bring an extra layer of professionalism to your proposal. Make the Call: There’s a learning curve that comes with adding this layer of technology. Those who learn to use it will be a step ahead and possibly be more efficient. While Bluetooth is helpful, it’s not an industry standard, so it’s completely up to your comfort level if you want it. A digital viewfinder is most helpful on a long-range laser distance measure where it’s difficult to see where the laser dot lands. When you’re measuring distances closing in on 400 feet, being off by a couple of degrees can make a big difference in your results. Make the call: You can only see red lasers out to so far before you need to bounce it off a target card and possibly have a second person helping. The digital viewfinder is really helpful for longer range outdoor applications. Some laser distance measures add a camera to their digital viewfinder. This can make it easier to generate a photo with measurement layovers. This works alongside a Bluetooth connection to transfer the results into an app. This feature appears on high-end laser measures and comes with a premium price. Make the Call: This is most helpful on commercial sites where there’s a lot of technology in place to get information where it needs to go quickly. However, using technology like this as a residential contractor will definitely set you apart. Many laser distance meters use AAA or AA batteries as a power source, though some have an integrated lithium-ion battery. Standard alkaline batteries are relatively inexpensive and easy to find. Rechargeable batteries make sense for some of the larger, more powerful models and keep you from having to carry around spares…as long as you remember to charge it! Make the Call: There’s not really a bad call here – alkaline batteries will keep your initial cost down and lithium-ion is more convenient. I like lithium-ion, but the majority of our meters are alkaline. How much you’re willing to spend is another first thing to consider. Laser measures can be as little $20 and extend up to $1,000. The best bet for you in one that checks off all your needs and stays within budget. Any of the bonus features you can get for the same price are, well, a bonus! Works great. Mainly estimation work. I always want to take it with me to the symphony, to measure the hall height, but my wife won’t let me.